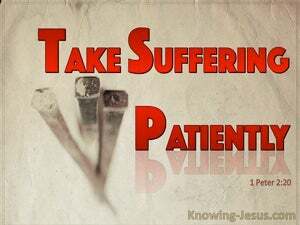 ﻿ 1 Peter 2:20 For what credit is there if, when you sin and are harshly treated, you endure it with patience? But if when you do what is right and suffer for it you patiently endure it, this finds favor with God. What good does it do if, when you sin, you patiently receive punishment for it? But if you suffer for doing good and receive it patiently, you have God's approval. For what kind of credit is it, if, sinning and being beaten, ye will endure? But if, doing good and suffering, ye will endure, this is graciousness with God. 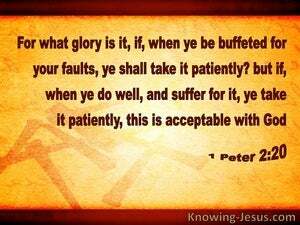 For what glory is it, if, when ye sin, and are buffeted for it , ye shall take it patiently? but if, when ye do well, and suffer for it , ye shall take it patiently, this is acceptable with God. But it is no credit to you if you put up with a beating you deserve. But if you patiently tolerate suffering for doing good, this is pleasing to God. For what praise is due, if, when you are punished for your faults, you endure it patiently? But if, when you do well, and suffer for it, you endure it patiently, this is praiseworthy in the- sight of God. For what credit is it, if when you do wrong and are beaten for it you patiently endure? But if when you do right and suffer for it you patiently endure, you have favor with God. But what praise is due, if, when you commit faults and are buffeted, you bear it patiently? Yet if, when you do well, and suffer, you bear it patiently, this is acceptable with God. For what glory is there, if, committing sin and being buffeted, you endure it? But if, doing good and suffering you endure it, this is grace with God. For what glory is it, if when ye commit faults and are buffeted, ye take it patiently? But if when ye do well and suffer, ye take it patiently, this is acceptable with God. For what glory is it if, when ye are buffeted for your faults, ye shall take it patiently? but if, when ye do well and suffer for it, ye take it patiently, this is due to grace from God. For what glory, if, sinning and being cuffed, ye endure? but if, doing good, and suffering, ye endure, this is grace with God. For what credit [is it] if, [when you] sin and are beaten [for it], you endure? But if you endure [when you] do good and suffer [for it], this [finds] favor with God. For what glory is it if you patiently endure while sinning and being buffeted? But if you suffer while doing good, and patiently endure, this is a grace from God. For what praise is it, if when ye be buffeted for your faults, ye take it patiently? But and if when ye do well, ye suffer wrong and take it patiently, then is there thanks with God. Where is the credit in standing punishment for having done wrong? No, if you stand suffering for having done right, that is what God counts a merit. For what credit is it if, when you are struck for a fault, you take it patiently? But if when you are doing well and suffer for it, you always take it patiently, this is acceptable with God. For what credit is it if you sin and are mistreated and endure it? But if you do good and suffer and so endure, this finds favor with God. For what glory is it, if, when ye are beaten for your faults, ye shall take it patiently? 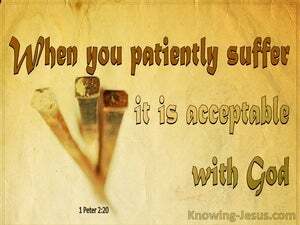 but if, when ye do well, and suffer for it, ye take it patiently [it is glory]; for this is acceptable with God. For what glory is it if when you sin and are punished you bear it patiently? But if you do well and suffer and bear it patiently, [this deserves thanks], for it is acceptable to God. For what sort of honour is it - if, committing sin, and being buffeted, ye endure it? But, if, doing good, and suffering, ye endure it, this, is thankworthy with God. For what glory would there be, if committing faults, and being buffeted, ye suffered patiently? but if, when ye behave well, yet suffer, ye bear it patiently, this is graciously accepted of God. What credit can you claim when, after doing wrong, you take your punishment for it patiently? But, on the other hand, if, after doing right, you take your sufferings patiently, that does win the approval of God. For what glory is it, if, when ye are buffeted for your faults, ye bear it patiently? but if, when ye do well, and suffer for it, ye bear it patiently, this is acceptable with God. If you do wrong and receive a blow for it, what credit is there in your bearing it patiently? But if when you do right and suffer for it you bear it patiently, this is an acceptable thing with God. For what credit is it to bear it patiently, if you do wrong and are beaten for it? But if you do right and patiently suffer for it, it is pleasing in the sight of God. For what glory is it, if, when sinning and being beaten, ye endure it? but, if, when doing well and suffering for it, ye endure it, this is acceptable with God. For what glory is it, if when ye sin and are punished for it, ye bear it patiently? but if when ye do well and suffer for it, ye bear it patiently, this will gain favor with God.